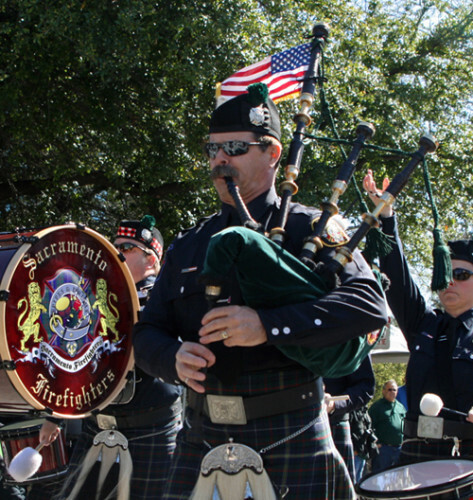 Hundreds of colorful marchers dressed in green, along with Irish and Highland dancers, pipe and drum bands, historic re-enactors and a variety of cultural organizations, joined together to be a part of the 19th Annual St. Patrick’s Day parade on Saturday, March 14, 2015. Always a free event, the parade stepped off promptly at 1:00 p.m. from 2nd & L Streets in Old Sacramento and proceeded throughout the national historic landmark. Over 80 units with more than 1,000 marchers were featured in this years parade. Irish dancers in elaborate Celtic costumes, bagpipers, bands, military regiments, police and fire representatives, costumed marchers and a variety of cultural organizations brought the luck of the Irish to the event. The parade draws people from all over Northern California, bringing together thousands in the 28-acre historic state park. Last year more than 15,000 people turned out to enjoy the festivities. “The O’Sacramento parade is a family-centered event that has become a much-anticipated celebration. It is one of Sacramento’s most colorful and fun traditions,” said Chris McSwain, Business District Manager of the Old Sacramento Business Association. “We are proud to host this annual signature event that Northern California residents and their families can enjoy,” McSwain continued. All Old Sacramento streets closed to traffic from noon to 3:00 p.m., as thousands lined the streets and Gold-rush era wooden boardwalks to enjoy the festivities. A reviewing stand was located at the intersection of Front & K Streets. Increased safety measures were enforced to provide a safe, secure and family-friendly event, as police officers, firefighters and paramedics were on-hand during the festivities.